As our motto “Dentistry for Families” implies, Skyview Ranch Dental Clinic offers dentistry for new patients of all ages. If you are looking for a pediatric dentist in Calgary, consider the general dentists at our welcoming, conveniently located clinic! You can rely on us for all of your child’s dental needs, ranging from a first visit to cleanings, orthodontics and more. Our pediatric patients include infants, toddlers and teens. And even though kids start to lose their baby teeth around 6 or 7 years old, it is still extremely important that they visit the dentist for proper dental care. Without it, children can develop oral decay or other problems that can continue to plague their new adult teeth. Taking your child to the dentist will encourage a lifetime of good dental habits and help keep their teeth healthy as they get older. It may help to bring your child to the office prior to their first appointment. If you are a patient, bring them with you to one of your appointments to introduce them to the dentists. Always answer your child’s questions as openly and honestly as you can, but refrain from using words that may sound scary (like needles, shots, drills and pain). Familiarize your child with what happens during a dental visit by reading popular children’s books written specifically on the subject. Do an internet search or call our office for some recommendations. Sometimes a child’s anxiety can be put at ease if they bring along their favourite stuffed animal or blanket. Please feel free to do so! Have a pretend dentist visit at home. You and your child can brush your teeth together, and your little one can count the number of their teeth using a mirror. 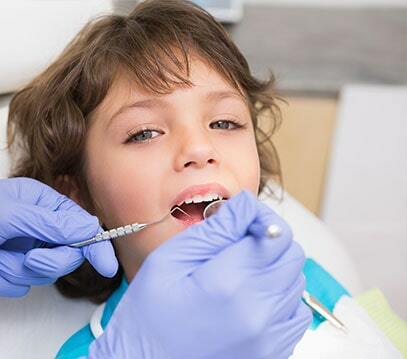 We offer several services for pediatric patients, including infant oral health exams, cleanings, fillings, the diagnosis and treatment of oral conditions or diseases, and care for chipped or knocked-out teeth. If you are searching for a pediatric dentist in Calgary, give the general dentists at Skyview Ranch Dental Clinic a call today! We provide a wide range of pediatric dentistry services for patients of all ages. When your child visits us for a dental exam or procedure, we will patiently explain everything that will be taking place during the appointment. You can count on our friendly, highly trained dentists to take excellent care of your child’s teeth and gums and prepare them for a lifetime of good dental hygiene habits. To schedule your child’s first dentist appointment or a routine dental cleaning, please contact our office. We’re located just off the intersection of Country Hills Boulevard and Metis Trail.